This week we thought we’d take a look at the cultural phenomenon known as ‘working from home’. And our ulterior motive? Well, contemporary furniture of course – we have some amazing, brand new home-office furniture that we can’t wait to share with you! 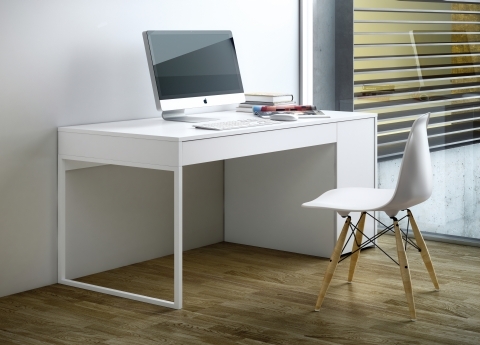 Like this new desk from Tema, with a handy cupboard on the side as well as a drawer. Lots of us work from home now but does it still have an image problem? Wasn’t it London’s colourful mayor who once joked: “We all know that it’s basically sitting wondering whether to go down to the fridge to hack off a bit of cheese before checking your emails again.” Well Boris, no, you’re wrong. And Virgin entrepreneur Richard Branson, who apparently spends a lot of his time working from his Caribbean island, takes the opposite stand, saying that “remote working is easier and more effective than ever”. We’re with Richard. Especially if there’s any chance of working from his Caribbean island. 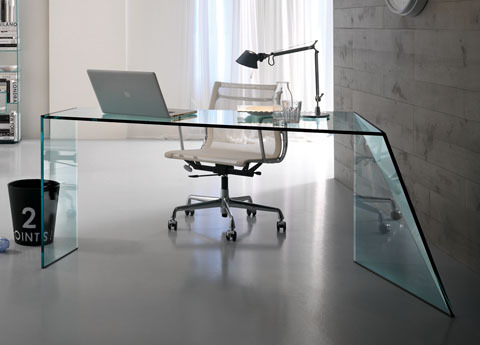 But if we have to work from our actual homes, not our fantasy ones, these fab new glass desks from Tonelli Design might help make working from the spare bedroom a little more palatable.. Most of us now have fast broadband, webcams, smartphones, laptops … and certainly in London and most major cities, getting rid of the daily commute would be a godsend, freeing you up to actually do more work. In the UK at least, it’s on the increase too. According to the CBI, a total of 59% of employers who responded to a survey in 2011 were offering remote working, up from 13% in 2006. And the pros and cons, all laid out neatly in the Government’s National Careers Service advice page (go on, we know you’re keen to read it!). But with contemporary technology in place – we think all you’ve got to worry about is the right contemporary furniture. Which is where we come in! 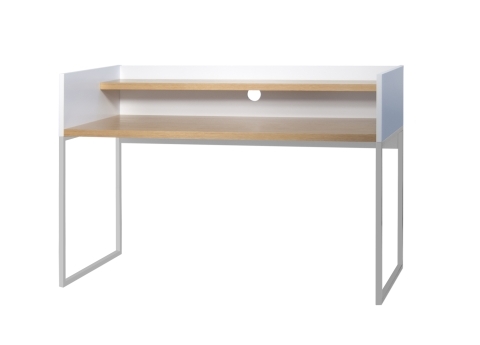 From affordable shelving and desks like the Paris desk below from Tema Home, to custom designed Italian home office solutions by Battistella or Jesse, or just statement desks – we have plenty to choose from. 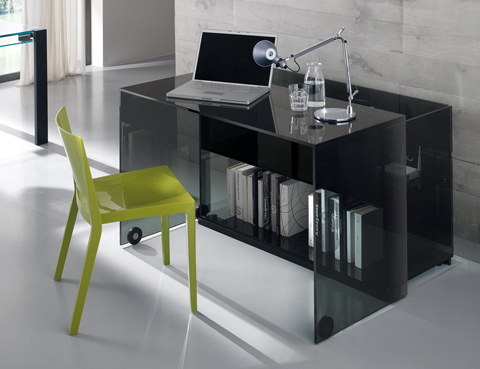 See all of our home office solutions in our dedicated Home Office Furniture section HERE.